You can make anything taste good with a little sauce. My sister once said “you can’t skimp on sauce” and for some reason this quote has stuck with me ever since. But I totally agree. There is nothing worse than ordering a meal or a salad or a burger, even, and it being delivered under-sauced. It probably has something to do with portion control, and quite rightly, perhaps, as many people don’t know when to say when with mayonnaise (people being, me). But, when does it become acceptable to go overboard on the condiments? When they’re healthy, wholesome and natural, that’s when. I always went overboard with things like bread or apple sauce with a roast or mayonnaise with sweet potato chips, but now I like to make sauce the main part of my meal, in an entirely acceptable way. There are more vegetables in my pesto than there are on my plate these days, but that’s the sheer beauty of natural, nourishing gastronomy. You get filled up by an unbelievably delicious amalgamation of the most nutritious ingredients. You can serve a kale, spinach and cashew nut pesto over your child’s pasta and they’ll have no idea it’s full of vegetables. Job done. A sauce, spread, dip or dressing has the ability to completely transform an otherwise soulless meal. A salad, for example, which is where most people start when reconditioning their dietary habits, is instantly better with a little extra virgin olive oil and lemon juice. This is what I settled for for so long, convincing myself actually, salad can be tasty. But then I discovered other natural oils, tahini, tamari, ginger and avocado, and have realised these ingredients will never fail you. A bowl of salad or warm vegetables with a knob of coconut oil and a twist of himalayan pink salt is probably the simplest way to do it. Mix the oil with smooth tahini, a dash of tamari, some ginger and a drop of agave and you’ve instantly got not only a delicious, vibrant mixture of freshly coated leaves or vegetables, but an even more nutritious one too. The thought of people disallowing themselves a little salad dressing kills me when I can think of a hundred ways you can make your own, if you just get to know the right ingredients. Yes, salad dressing is bad. It’s full of sugar, emulsifiers, thickeners, flavourings and additives and has little to no nutritive value at all. But make coconut oil, avocado oil, extra virgin olive oil, tahini, tamari, nut butter, ripe avocados, nuts, seeds, fresh herbs, sesame oil, fresh or ground ginger and agave frequenters in your kitchen and you’ll want to eat salad for the rest of your life. Protein-rich, high in healthy fats and abundant in vitamins, minerals, antioxidants and micronutrients, you’ll find it hard to believe they can do you good. We’ve all had this conversation: “Why is everything that tastes good so unhealthy, and everything that’s good for you, just boring?” Honestly, I’m still coming to terms with this too, but it really is possible to eat delicious food that can do your body a million favours or more. It may cost a little more, it may take a little research, but your body and your taste buds will thank you in the end, and your mood, energy, skin and metabolic processes will instantly improve. Everyone craves a steak now and then, I know that as a fact. I have vegetarian friends who have never eaten steak in their lives who, oddly, still crave it from time to time. And what is steak without peppercorn sauce? Well, its like a green juice without any vegetables, isn’t it? Heat a little olive oil and coconut oil in a saucepan and add the garlic along with the shallots or onions, if using. Sauté until they start to become golden, then add the peppercorns, tamari, mustard, bay leaf, tarragon, onion seeds, nutritional yeast and mix until combined. Next, add the cream, gradually, along with the hot water and a little salt and/or extra nutritional yeast depending on your taste. Simmer the sauce for 2-3 minutes until it begins to reduce and thicken slightly. Heat until it starts to bubble then remove from the heat and pour through a sieve into a serving jug to catch the peppercorns, bay leaf and shallots/onions, if using, to make the sauce smoother. Store in the fridge for up to a week, but stir before serving as it will separate and may stiffen slightly. Enjoy hot or cold. 2-3 Tablespoons Coconut Milk, tinned or from a carton (solid milk from the tin will add a thicker, creamier texture but normal coconut milk will still add a wonderful flavour and help to thin and combine the ingredients). Preheat oven to 180c. Fill a medium pan with about two inches of water. Bring to the boil and then lower the heat. Place your steamer in/on the pan and place the aubergine – sliced lengthways – into the steamer. I use a small metal steamer that looks like a sieve. If you have a proper layered steamer, use this as you normally would. Place a lid on the top and leave for 10 minutes. The aubergines should be soft when you remove them. Transfer the steamed aubergine to a baking tray and drizzle with 1 tablespoon of the oil of your choice. The sesame oil gives this dish an amazing flavour but if you don’t have any, olive or coconut will work fine to crisp up the edges of the aubergine. Bake in the oven for about 15-20 minutes. In a bowl, combine the remaining oil, nut butter, coconut milk, tamari, agave, lemon juice, diced garlic and crushed ginger with a fork. Mash the nut butter to disperse it into the rest of the mixture and whisk to combine. 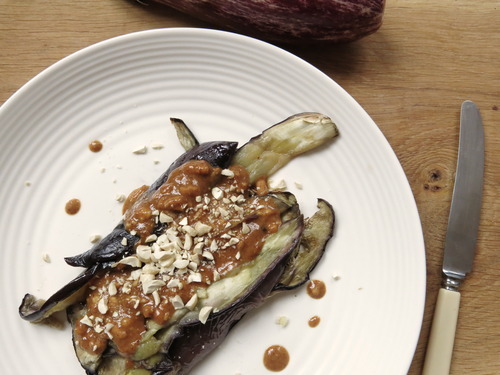 When the aubergine is slightly crisp but still incredibly soft, remove from the oven and pour the sauce over evenly. You can stir the sauce through the aubergines and serve like that or even leave the sauce separate and serve as a dip. Create a little aubergine fondu. Top with toasted or raw nuts and/or seeds. I also like lemongrass coconut yogurt. Simply take 3 tablespoons of original Coyo or solid coconut milk and place in a blender. add some fresh lemon juice and a drizzle of fresh lemon juice. Blend until combined and serve on or with the aubergine. You could also add mint to the blender to add flavour.